Borussia Dortmund are looming as a Champions League threat after taking command of Group A with an incredible 4-0 home win over Atletico Madrid on Wednesday. Lucien Favre’s Bundesliga leaders demonstrated impressive maturity to pile on three second-half goals and protect their unbeaten record in all competitions, while inflicting Diego Simeone’s heaviest loss as Atleti coach. 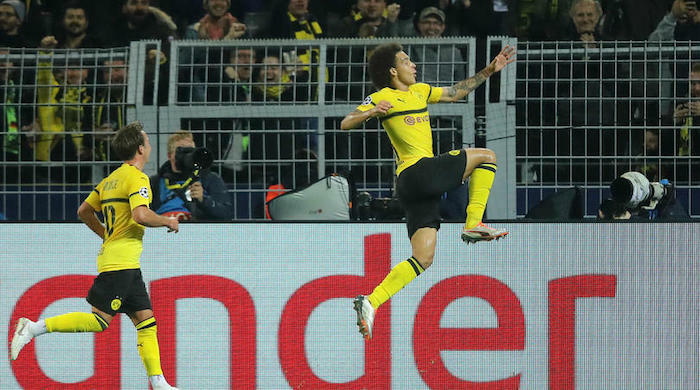 The home side’s defensive aptitude was scrutinised after Axel Witsel’s heavily deflected 38th-minute opener and they convincingly passed the test with a dominant final 20 minutes, Raphael Guerreiro netting twice either side of a simple finish from fellow substitute Jadon Sancho. The convincing result means Dortmund are now three points clear of Atleti, who remain five points ahead of the bottom two. Dortmund, already without the in-form Paco Alcacer, suffered a first-half injury setback when Thomas Delaney hobbled off, although Favre’s mood was soon lifted. Witsel’s shot from the edge of the area took a thick deflection off Saul Niguez and completely wrong-footed Jan Oblak, who was thankful that Dan-Axel Zagadou headed wide from a corner four minutes later. Saul emerged after the interval on a one-man mission to wipe out the deficit but must only have felt a stronger sense of injustice as three attempts all went close, the second a sublime curling effort that met the apex of post and bar. Achraf Hakimi perhaps cost Marco Reus the chance to mark his 50th European appearance with a goal as BVB eventually regained a foothold but the left-back quickly atoned with a pair of assists. He first squared for Guerreiro’s simple finish on 73 minutes and then provided Sancho with a tap-in on the end of a counter-attack 10 minutes later. And worse was to come for Atleti when Guerreiro was gifted a brace from Filipe Luis’ bafflingly loose pass in the last minute of normal time. It was a case of no Paco, no problem for a well-functioning Dortmund as they crucially proved capable of overcoming top opposition even without their free-scoring striker. Belgium boss Roberto Martinez recently described Dortmund’s recruitment of 29-year-old Witsel as the signing of the season and it is hard to disagree on the strength of his performance here, interceptions, tidy passing and attacking intent comprising an all-action performance. Simeone may consider whether reinstating Costa after a two-match absence was the right call given how tentative the workhorse was in front of goal and his general struggles to create anything meaningful on the ball. Dortmund will attempt to maintain their blistering Bundesliga form at home to Hertha Berlin on Saturday as Atleti seek to stay in touch with LaLiga’s top four in a meeting with Real Sociedad.